This idea has been incubating for a long, long while and I’ve waiting for the perfect moment to bring it to life. It’s finally time and I’m beyond excited to share this with you! 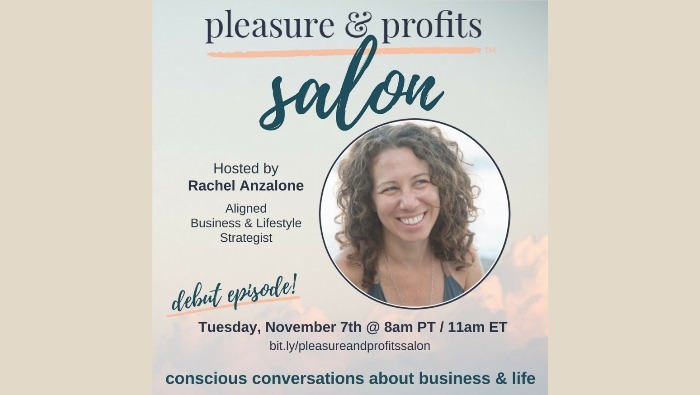 A free weekly broadcast for women entrepreneurs and lady bosses seeking strategies and inspiration to create alignment in their business and life. Check out Episode 1 here, where I talk about WHY Pleasure & Profits and what to expect in the coming months. Join me on Facebook Live Tuesday mornings at 8am PT / 11am ET for conscious conversations with women entrepreneurs and lady bosses sharing their own experiences, struggles and strategies around creating alignment and sustainability in their business and life.